Kaizen is a deeply held belief that everyday managers and staff can turn problems into opportunities, and find ways to become better for customers, employees, vendors and stakeholders. It is a compelling desire to achieve operational excellence. "Traditional Western philosophy may be summarized as, 'if it ain't broke, don't fix it.' The Kaizen philosophy is to 'do it better, make it better, and improve it even if it isn't broken, because if we don't, we can't compete with those who do'" (Steve Hudgik, Graphics Products, Inc.). Continuous Improvement—Kaizen—is an idea whose time has come for the small to midsize-business community! So, What Exactly Is Kaizen? Kaizen is the ongoing, systematic, incremental improvement in the way things are done. It is a relentless attempt to eliminate the unnecessary activities, delay, waste, and variation of business processes that add cost without adding value. Kaizen results in improved lead-time, efficiency, quality, productivity and customer loyalty. "The goals of continuous improvement are simple: 1) make things easier 2) better 3) faster and 4) cheaper” (Shigeo Shingo, pioneer of Lean Thinking). It is the new "best solution"—from the customer’s point of view (five customer types). Kaizen is a mindset and practice that encourage reflection, teamwork, standardization, mastery of the process, experimentation to find better ways, comparison to baseline accomplishments, incremental and ever-evolving change, and the ongoing improvement of results. It asks the simple question, “How can I do this better?” Kaizen is the everyday quest for perfection! Many larger companies have adopted one or more formal methodologies to achieve Continuous Improvement” (e.g., Six Sigma, Lean Thinking, or the Theory of Constraints). However, these powerful strategies are rarely considered by small business owners—a fact we hope to change! Daily improvement applies to every area of your business—a shorter lead-time attracts more customers; modified words on a web page induce more visitors to buy; bottled water in the reception area pleases guests; an improved business form or application reduces errors; a more compelling radio ad boosts sales leads, and so forth. There are hundreds or even thousands of possibilities to improve any organization. Below are 10 ways to help the philosophy of Kaizen—Continuous Improvement—take hold in your company. Start with Yourself – Many entrepreneurs are so busy “sawing” they have little time to step back, read, ponder, analyze, plan, and essentially “sharpen the saw.” Get connected with your numbers (leading and lagging indicators), and with customer, employee, and vendor feedback. Read skill-based business books and articles. 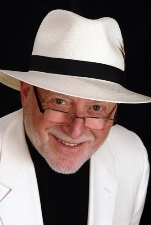 Spend time in the Zone working on your business (Michael Gerber). Seek ways to improve your own personal performance, and encourage those around you to do the same. Your company—people, products, and processes—will improve at the rate you improve. Lead by example! Involve Everyone – Kaizen is a strategy that involves every employee, from management to the cleaning crew. Hold business improvement workshops at the company, department or team level—perhaps at the location of the business system you are attempting to improve. Challenge employees to routinely submit suggestions for positive change. “In Japanese companies, such as Toyota and Canon, a total of 60 to 70 suggestions per employee per year are written down, shared and implemented" (Steve Hudgik). Challenge the Status Quo – Throw out all your old fixed ideas on how to do things. Replace “sacred cows,” personal opinions, and “it’s the way we’ve always done it” with performance facts and data. Numbers are the language of improvement. Avoid the emotional traps of blaming people or making excuses that prevent you from discovering the real problem. Once you have established the new best-way of doing something, stick with it until a better way is found. When confronting old ideas and traditions, apply the Rules of Engagement. Get Specific – The dollars—made or lost—are in the details of your business systems and processes. Drill down. Use a 5-Whys Analysis and keep asking “why” until you get to the root cause of the problem. Improve specific steps or components in your business systems and processes; there is no other way! Get defects to less than 1%. Cut lead-time in half. Do little things to WOW customers or employees. Pennies earned from small improvements add up fast. Keep It Simple and Inexpensive – Ideas for incremental improvements that bubble up from workers are usually easier to implement and less expensive. Like our friend MacGyver, apply creativity and craftiness before cash. 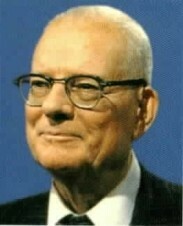 Follow the 80-20 Rule; do the twenty-percent of things that get you eighty-percent of improvement results. And do it NOW! Don’t wait until you can achieve perfection. Focus on the Right Things – Improve the core business systems that enable you to find and keep customers, and earn more money. Find ways to provide customers greater value and a better buying experience. Zero in on removing the obstacles, bottlenecks, and weak links in your business processes that slow lead-time, order completion, and collection of cash. Fast throughput of products and services creates happier customers and more profit. Remember: quality plus speed equals low cost. Put emphasis on enhancing business systems that drive your Balanced Scorecard goals, or that improve a line-item number on your financial statement. Provide Training – Kaizen involves setting performance standards for your business systems and processes and then striving to elevate those standards. Continuous Improvement requires ongoing development of your most important asset—PEOPLE! Tom Peters, business-management author, teaches, "If your company is doing well, double your training budget; if your company is not doing well, quadruple it!” As process changes are made, face any resistance by employees head on—Listen-Thank-Consider-Decide. Look for Breakthroughs – Up to this point, we have focused on small incremental changes. However, Kaizen will sometimes produce breakthrough improvements—a moment to celebrate! What’s a breakthrough? Chet Holmes, sales and marketing guru, says, “Let me explain a breakthrough. It's when you find a method [system] of doing something that dramatically accelerates your ability to accomplish your goals (“The Ultimate Sales Machine”). Never Stop Improving – Halt the process immediately to fix quality or customer-related problems. Don’t let problems accumulate for later handling. Reflect daily (in the Zone) on your opportunities for improvement and innovation. Make business improvement workshops a weekly habit. Implement a suggestion-box system that calls for employees to submit so many improvement ideas per month or year. And be sure to compensate people appropriately for implemented solutions. Just one improvement a day is 260 improvements a year! 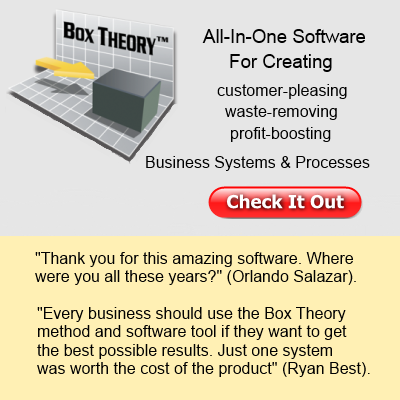 Get Box Theory™ Products – Forgive me if this seems a bit like a sales pitch. I seriously believe that applying the Box Theory™ Way—and software tool—is the most important thing you can do to get Continuous Improvement working in your company. It is a one-of-a-kind product based upon decades of proven principles—not too hard, not too basic, but just right for the owner of a small to midsize business. 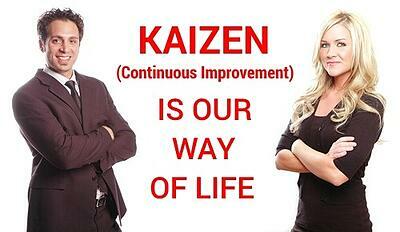 In Japan, Kaizen is a system of improvement that not only includes business, but every aspect of personal life. 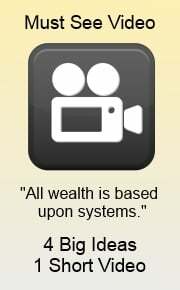 Like Systems Thinking, it becomes second nature. Continuous Improvement of people, products and processes should be the endless quest of entrepreneurs, business owners, and managers. Wouldn’t you agree? In short, Continuous Improvement of common tasks produces an uncommon organization! Now, what improvement could you make today?